Winter at it's best. We have had a very mild, unusually dry season so far. And yet we have about 150% snow pack in the Olympic Mountains now anyway. This week the rain and freezing levels will build up more of that snow, which our juvenile salmon and steelhead will need all summer ahead. It is all about the flows. And right now we have got the river flows that fly fishermen, and migrating wild winter steelhead need. 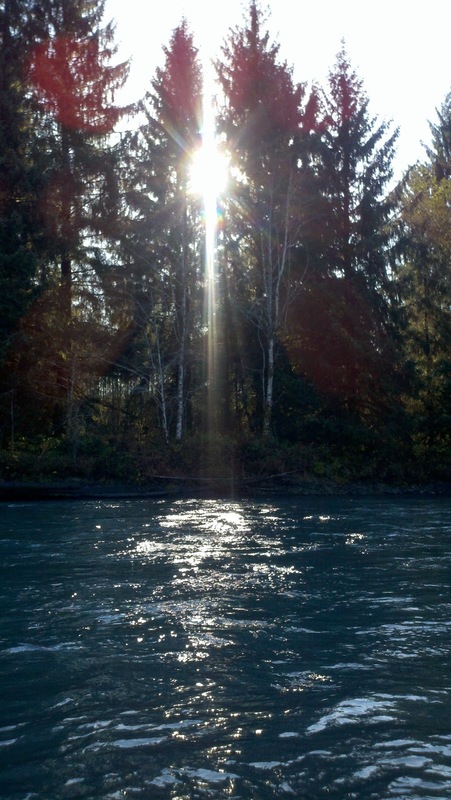 If you want to swing flies for steelhead here with me, now is the time! Dress warmly, in layers, and put on your raingear and Be Here Now! Winter Run Steelhead / Summer Run Steelhead, Trout, Sea-Run Coastal Cutthroat Trout. Phone: 360-385-9618 Always leave a message and return number verbally on the recording! 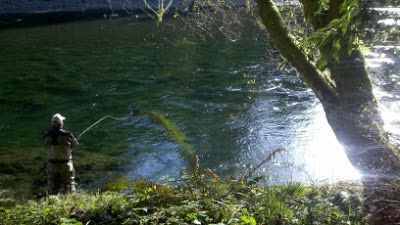 Blog: http://olympicpeninsulaflyfishing.blogspot.com Be Here Now! Between the raindrops we have managed to get some good periods of winter steelhead fishing out here on the Olympic Peninsula coastal rivers. Last week we had enough rain and warm air to push the rivers up for a few days, far less than what had been forecast, but enough to move the fish and revive the flows everywhere. This always moves some fish upriver. And now we are getting another eastern Pacific ocean high atmospheric pressure "front" settling in, much as we had experienced the one earlier last month. The computer forecast models show that it will be mostly mild and dry here for well over another week or more ahead. And the rivers are now coming into sweet shape indeed for swinging flies on wild winter steelhead..
With these milder conditions we can expect that we will be using lighter sink tips, and even floating lines or tips sometimes, and using lighter presentations, and sometimes a smaller fly. In a previous posting here I talked about low water steelhead fishing in the winter. Here we go again. For now. Winter can be full of surprises here, but the longer that we get milder weather the less likely it is that we will suffer a major event. So let us enjoy this time for what it is- another mid winter respite in one of the weirdest winter seasons I have witnessed here so far. Do be careful driving out here as we expect overcast and fog, and freezing temperatures at ground level part of the time ahead, enough to be forewarned of black ice conditions on the roads, especially at night and early morning. See my previous posts for links to weather forecasting tools and travel links. February and March are our prime months for winter steelhead here. We call this "The Heart Of The Run". As popular as the earlier winter runs of hatchery steelhead are to meat hunting fishermen, and even though the November through January stretch carries home more fish here most years, this is our most popular time. Fishermen come here from all over the world. Everyone wants to catch a wild winter steelhead on a fly rod. Well, among fly fishers anyway. And our focus is always on fair chase, catch & release, fly fishing only. All of my steelhead fishing is done with traditional, swung fly presentations, with single barbless hook flies. These are very pleasant walk and shallow wade trips. We avoid the boats and the chaos. Most of my guests are using spey rods these days. 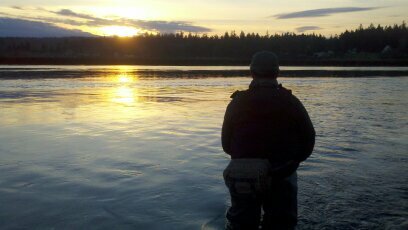 Once I got into using two-handed rods, and spey and Skagit casting, it was hard to go back to the single handed rod. It is simpler and more effective. I feel that all of this is an appropriate approach to these precious wild fish. And this choice reflects my personal commitment to conservation and restoration. There are easier and faster ways to catch these fish. But that is the whole problem here now, and with many other aspects of our society as well- people want a quick, cheap result. It is all about the score. And in too many places today our wild fish resources are severely impacted by this aggressive attitude. I take fly fishing as an art, not a contact sport. This is a practice of skills, a refinement of craft, and a creative expression of an ancient past time. Fly fishing has roots that go over 1000 years back in human history. Our wild fish are a finite resource that we must not abuse or take for granted. And especially now, as we focus on these wild winter run steelhead, we must remember that even catch and release fishing has detrimental impacts when done without care. The ancient Olympic Peninsula temperate rainforest is especially beautiful now, with the deep shades of green; the dusky marl and jade and emerald greens of the icy waters, the wild green jumble of plant life, ferns, vines and towering trees, the moss covered stumps and rocks, the long beards of moss dripping from the tall, sun glittering maples, firs and alders. It is amazing to me to see plants growing in the tree forest canopy, as much as a hundred feet overhead. This is one of the densest and most diverse ecological communities on earth. For tens of thousands upon thousands of years these wild fish have survived and adapted to the steep, brawling flows of the Olympic Mountain rivers. Threading their way across time, through cataclysmic volcanic changes, glaciations, ice ages, floods, landslides and countless predators. It is really miraculous when you consider all that they have had to endure and adapt to in order to exist today in any number. Not to mention what it takes for one egg to become fertilized, successfully hatch to produce a fry, then develop to the smolt stage, then to migrate downriver to become a sea run fish, that may travel many thousands of miles at sea before returning to spawn years later. Another reason for conservative choices in angling techniques and land use planning. We owe them that much. And now they are coming home, returning to their ancestral waters, their natal streams and rivers, carrying the genes that have passed across the millenniums, through countless generations. Perhaps it is their enduring qualities that we revere, a symbol of freedom and simple strength. Maybe we see in them something of what we have lost ourselves, still shining brightly. Wildness can only remain so if we protect it. Despite everything that these fish have overcome, man is turning out to be the greatest threat, and their last hope. On the saltchuck, my friends down in south Puget Sound are having some good sea run Coastal Cutthroat Trout fishing days during these milder spells of nearly windless days. They will expect to begin to see the Chum Salmon and Pink Salmon fry in the estuaries, in mid to late February, a few weeks to a month earlier than we will see ours up here on the northern waters. And the Cutthroat will be all over them. And even up here, and down on Hood Canal, they are having some good multiple fish days on Cutthroat this winter, often some good sized ones too. We do not see many small fish this time of year out there. So during this lucky milder weather break you might do well to go visit a beach with your five weight and a hand full of smaller- 1"-1-1/2" - streamers and fry patterns. I resume guiding on the the beaches here by mid April up here. If you want to come, plan well ahead as April through June are busy sometimes. And with this being another Pink Salmon run year here, we will expect to see the earliest Pinks showing up around the fourth of July. We usually catch them while we are sea run fishing. Big fun on a five weight! We release them too. I will be guiding for winter steelhead out here all winter- right through The Heart of The Run. 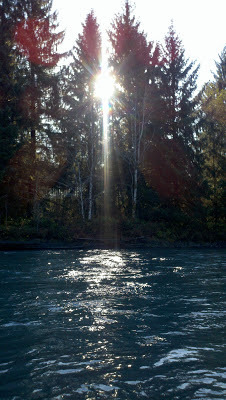 Come join me on the Hoh, the Bogachiele, and the Sol Duc rivers. Each has their own unique character of flows, reaches and runs, and all are set amid stunning and unique beauty. You will never tire of fishing here. And you will have an opportunity to catch the wild fish of a lifetime. If you do want to come fly fishing with me you will need to plan well ahead. Feel free to call or email anytime. I am happy to help you make your plans to fish out here. I usually return messages within a day or two at most, as long as you leave your return number.